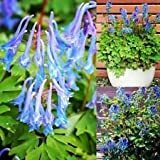 Corydalis flexuosa growing herbaceous of the genus Corydalis also known as Fumewort, Corydalis flexuosa perennial deciduous plant, used as ornamental ground cover plant fragrant, can grow in temperate climate and grow in hardiness zone 6-8. Leaves color green, can be with yellow or purple in triangle shape with deeply lobed margin. Flower fragrant, color blue or purple in cone shape.